The slogan SAVE OUR DAMS is painted in large white letters on a red barn along Hwy 195 north of Pullman. It's been a rallying cry for southeast Washington for almost two decades. Unless you're a fisherman or a farmer, you may have no idea what the barn is trying to tell Cougar football fans. Last Wednesday, the Washington Policy Center's WSU Young Professionals chapter sponsored a campus debate on the question of breaching or keeping the dams. 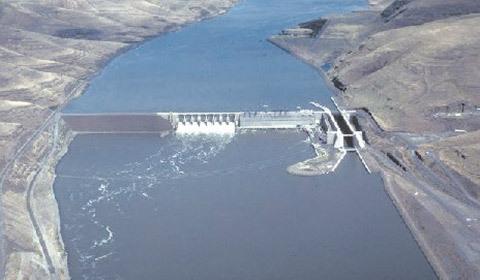 The dams in question are the four Snake River dams upstream of the confluence of the Columbia and the Snake Rivers. Their primary purpose is to connect the Port of Lewiston to the ocean for barging freight, and to provide flood control. Power generation is a secondary function. The dams and locks are operated by the Army Corps of Engineers. The pro-dam team was represented by Todd Myers, Director of WPC's Center for the Environment, and the Honorable Doc Hastings, former U.S. Congressman representing central Washington's 4th Congressional District. No one argues that given their druthers, salmon prefer rivers without dams. So do some people, and "save our salmon" has become their counter-rallying cry. More specifically, Save Our Wild Salmon. The pro-breach arguments were presented by Sam Mace, Inland Northwest director of Save Our Wild Salmon, joined by Kevin Lewis, executive director for Idaho Rivers United. Both the pro-dam and pro-breach teams kept returning to the distinction, or lack of distinction, between salmon and wild salmon. While Sam Mace advocated for counting only wild salmon toward recovery numbers, Doc Hastings was equally adamant in arguing it's a distinction without a difference. Columbia River hatcheries first released smolts into the river system in the late 1890's. "That's 25 generations of fish cross-mating and spawning in the wild," Hastings said. The killer whale population listed as endangered who feed on salmon only care if they're big, not if great-great-great grandfather was a hatchery smolt. It only matters if one wants to use the Endangered Species Act as a hammer to remove dams. Three of the four dams were generating power by 1970 and Lower Granite had been under construction for eight years before the ESA passed in 1973. Salmon weren't a primary consideration in the design and construction of the original facilities, although much has been invested in new technology to improve fish survival. Salmon runs set records in 2016, with more salmon returning up the Columbia-Snake River system than any time since record-keeping began in the 1930s, as long as you count all of the salmon. Todd Meyers focused on the value of investments already made in both transportation and hydropower generation. Congress voted to extend the Columbia River barge system to the Snake River in 1945, at the start of an era transforming our transportation infrastructure. The Federal Airport Act passed in 1946 and the interstate highway system bill in 1956. Our robust but aging rail system wasn't the bright new thing anymore. Tracks were abandoned and removed instead of maintained as investments. Meyers pointed out the real issues are trust and tradeoffs. Wind and solar are the bright new non-carbon based technology, but both are intermittent and rely on hydropower to balance the load. The average annual 8.37 million megawatt hours of power generated by the four dams has to be replaced from somewhere, and will have a cost in both dollars and carbon. Mace pointed out how transportation demand has changed. Palouse farmers are diversifying crops, growing more pulses and less wheat. Pulses, which include garbanzos and lentils, are shipped in containers but the Port of Portland no longer handles containers. Overall barge traffic is down. Maintenance costs for the barge system are spread across fewer customers, and rail demand has increased to carry containers to the Port of Seattle. We've reduced diversity in our transportation system before and regretted it. If Snake River barges are abandoned and dams removed in favor of new rail lines, we are circling back to 1945. Judge Simon ordered a new study because of the fish impact, but power and transportation also have long-term implications. Do we abandon investments in old infrastructure because maintenance costs are less appealing than building shiny new things? WSU Debate Archived at WPC Young Professionals Facebook Page.